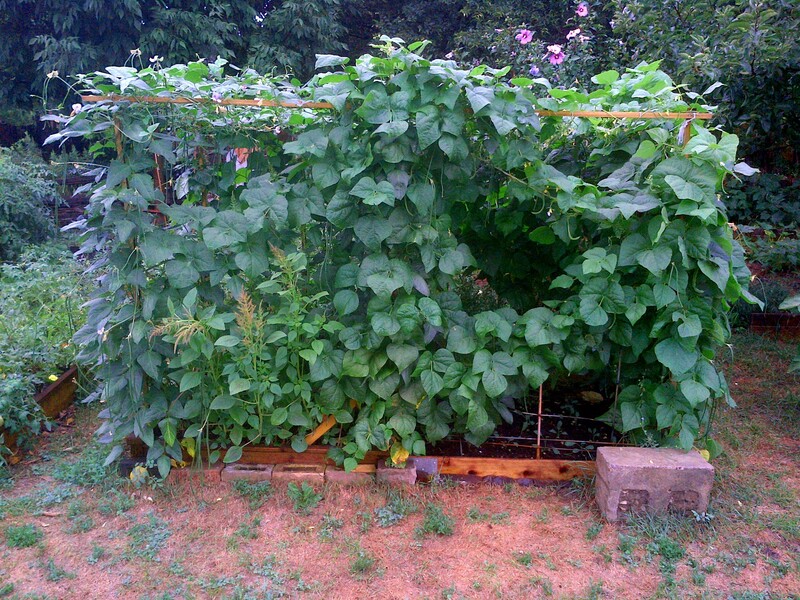 In one of my plots in the Oakvale Green Community Gardens, pictured above, yardlong beans (Vigna unguiculata) grew very well in 2012 and formed a dense canopy over the small 4′ x 8′ plot. 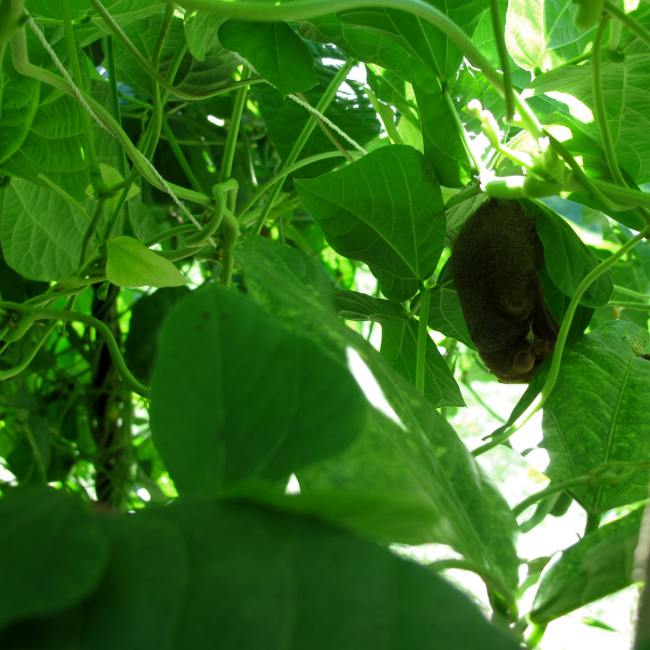 One morning i went to harvest beans and found a little brown bat resting, in underneath the bean canopy. At first i though it was a mouse! Rather than disturb the bat, i skipped watering and harvesting, just leaving the plot alone for the day. 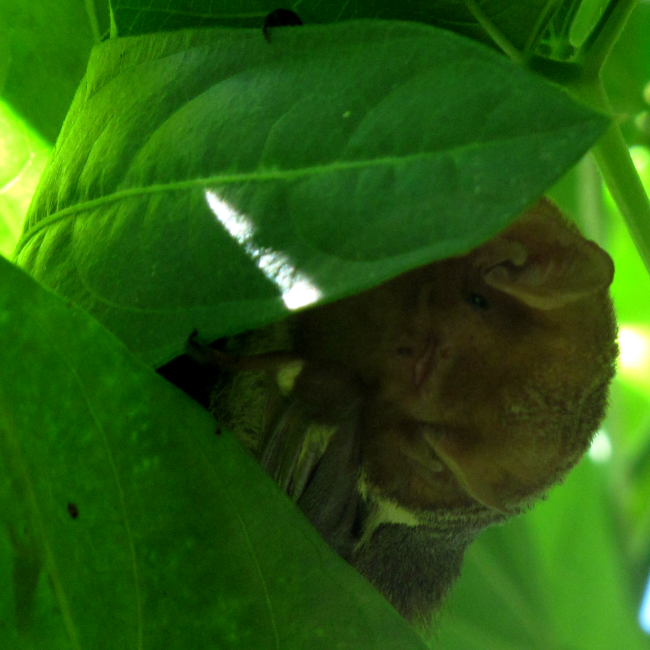 The next morning the little brown bat had not returned and wasn’t to be seen again by me, which is understandable since the gardens can be a busy place, especially at dog-walking times. The gardens area is probably good for bats because of the park lands, abundance of trees and insect-attracting street lights on the surrounding roads, which are typically very quiet at night. But there is not, as far as i know, a nearby and reliable source of water such as a pond or stream. The little brown bat is the most common bat in Canada and, according to the Canadian Wildlife Federation, is the bat most likely to make shelter in human buildings in Canada. Check out Hinterland Who’s Who for more on the little brown bat (Myotis lucifugus). You can attract little brown bats to your area by proving a home in a well-positioned spot; see the Toronto Zoo’s Bat Box Programme. You can also get the Bat House Builder’s Handbook (2013), which says the little brown bat is one of the species most likely to inhabit a bat box.